When you think of the magic of Walt Disney World, the one thing that comes to mind is the scents. The smell of the bakery while walking down Main Street U.S.A. The water smell from Pirates of the Caribbean. The lobby smell at Disney’s Pop Century. Everything at Disney has a smell. 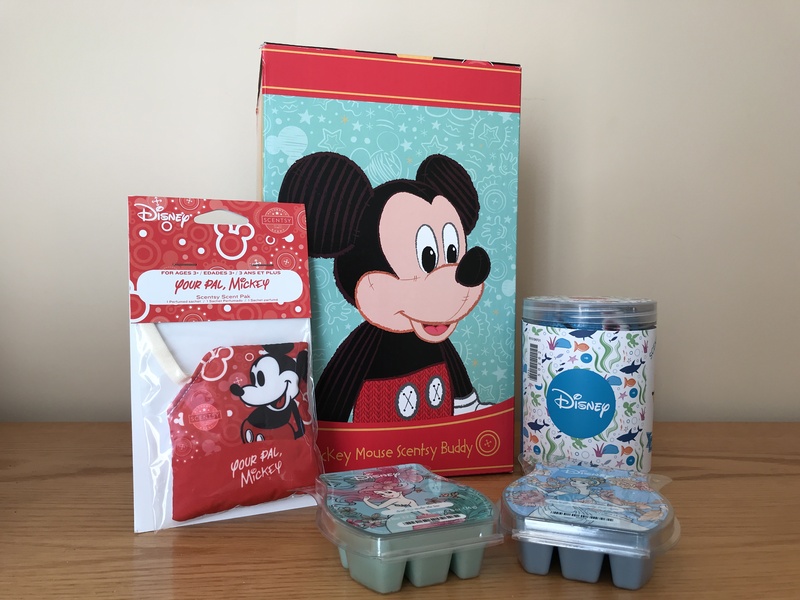 Mickey Mouse – Scentsy Buddy, My Pal Mickey Scent Pack and Disney Scentsy Bars. Photo by Kimberly Masimore. I was looking forward to the smells of Disney coming to life through the new official Disney Collection offered through Scentsy. However, they are not really Disney park smells. They are smells inspired by Disney characters. This is not necessarily a negative thing, but if you are looking for the smells that remind you of home, these are not the smells you are looking for. I recently had the opportunity to sample the new Disney Collection from Scentsy. For full disclosure, I received the products to try as a free sample and was not paid by Scentsy for my opinion. However, if you are looking for mild scents that are light, you may have come to the right place. I really enjoyed the opportunity to sample new smells featuring some of my favorite Disney friends. It’s nice to find fragrances that aren’t too strong. You know the overly fragrant kind, where you are overwhelmed and can’t get the scent out of your nose for days. Luckily, Scentsy is mild alternative to scents you may already like. Ariel: Under the Sea Scentsy Bars. Photo by Kimberly Masimore. Scentsy Bars are the wax melts that you put in a warmer to allow fragrance to fill the air. 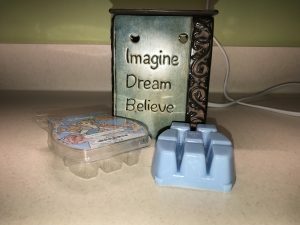 I use wax melts often throughout my home and was interested in trying Scentsy Bars for the first time. I chose Ariel: Under the Sea and Cinderella: Happily Ever After. Ariel: Under the Sea Scentsy Bars with a wax melt warmer. Photo by Kimberly Masimore. 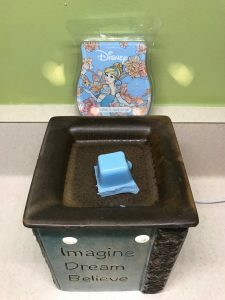 Ariel: Under the Sea Scentsy Bar in a wax melt warmer. Photo by Kimberly Masimore. Cinderella: Happily Ever After is described as a romantic bouquet of gardenia, forget-me-not, and frosted lemon. This scent was definitely a perfume/floral mix and is true to its description. It was also not overbearing and a good choice for one small room. 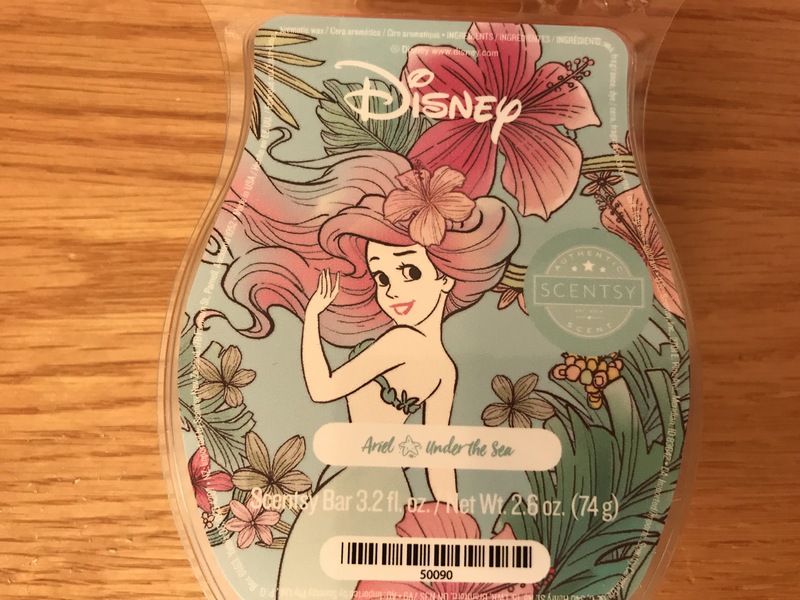 Other Disney Scentsy Bars include Belle: Enchanted Rose, Hundred Acre Wood, Love & Kisses, Minnie, Just Keep Swimming, Mulan: True to Your Heart, and Your Pal, Mickey. 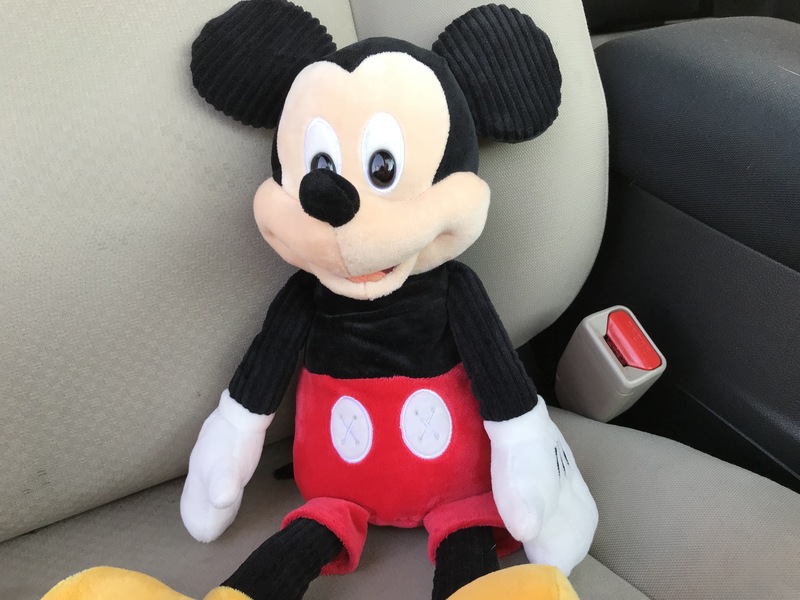 Mickey Mouse – Scentsy Buddy and My Pal Mickey Scent Pack. Photo by Kimberly Masimore. 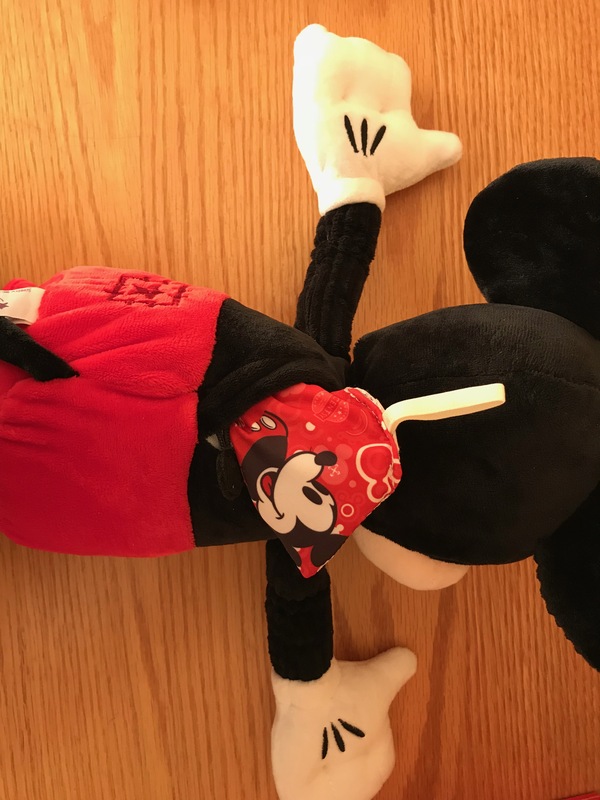 I absolutely adore the Mickey Mouse – Scentsy Buddy (you can also get his best gal, Minnie.) He is cute, soft, and a great portable companion for freshening up your favorite area. I decided to put him in the car and see how he did in comparison to a previous air freshener I used there. 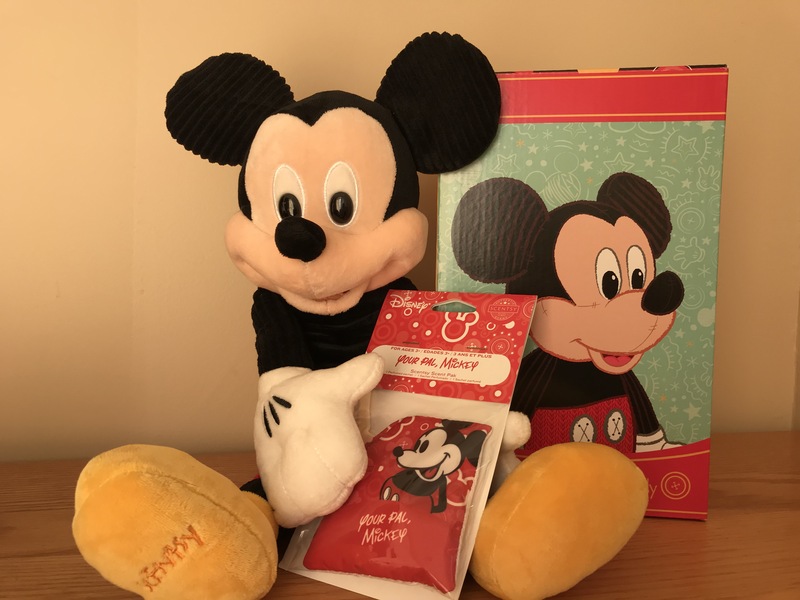 Mickey arrived with a Your Pal, Mickey Scentsy Scent Pak. Mickey has a nice concealed zipper on his back to hold your scent pak. This allows him to still appear to be an ordinary stuffed animal with “extra special magic.” As a side note, I think the scent paks are a great size to stick in a gym bag, a closet, or underneath a seat in your car for a stronger smell than offered when placed inside Mickey. I put Mickey in the car and returned about an hour later. I found the interior of my car to be a mild, fruity smell. It was not as strong as the cardboard scents you hang from your review mirror. This is a good thing. My kids (and myself) cannot handle over-powering smells. Speaking of kids, a mildly scented stuffed animal would be a perfect comfort item to provide them when travelling, on sleepovers, or when afraid of monsters under the bed (no offence, Mike and Sully!). My favorite car buddy! Photo by Kimberly Masimore. I’d be interested in trying some other scents with Mickey. Scentsy has bakery, citrus, floral, fresh, green, spicy, woody, and fruity smells so there seems to be enough variety to all smell interests. I also received the Dory: Just Keep Swimming Buddy Clip, which is a small stuffy with a clip for attaching it to a bookbag or another item. I wanted to see how far the scent would go on this little gem. At first, I hung it up in my daughter’s room. After a little over an hour, there really wasn’t much of a smell. I moved to option 2 and hung Dory in her closet. Dory: Just Keep Swimming Buddy Clip. Photo by Kimberly Masimore. 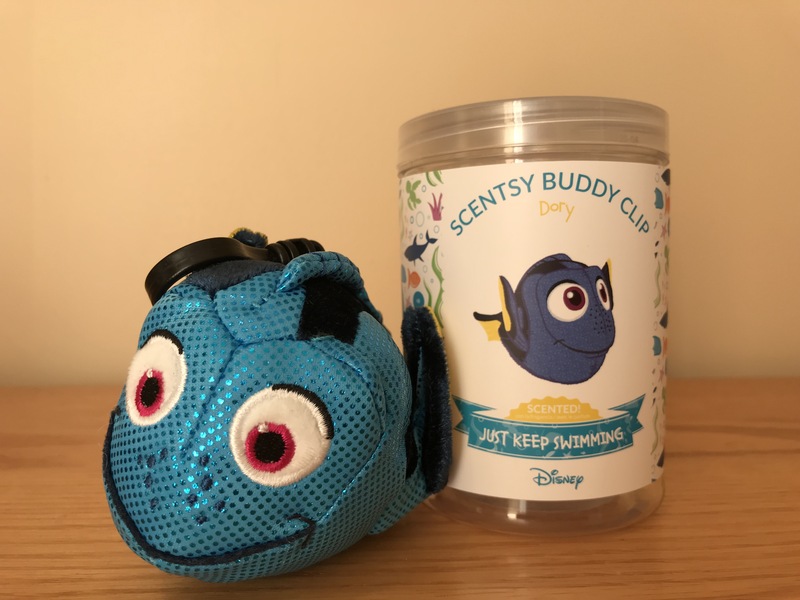 I forgot about Dory for a while, which was actually a good thing, because I really wanted to see how long the scent would take. I was really impressed with the scent that filled, but didn’t overwhelm, her closet. Dory has a mild perfume/tropical smell. It was by far my favorite scent. It did a great job freshening up her closet and the best part is that her clothes didn’t pick up the smell. It worked perfectly. Get the Disney Collection by Scentsy HERE! I don’t prefer perfumed or overpowering smells. Most of the smells I sampled were not necessarily my “type” of smell, but I enjoyed stepping outside of my comfort zone to sample a variety of scents. I really enjoyed how mild the scents were. They weren’t overpowering, yet they were obviously there. The melts are definitely good for a single room, but you will need more than one warmer if you want to fill the house. My favorite product is definitely the Scentsy Buddy Clip. It is cute, portable, and gives off just enough scent to do its job. I only wish that Scentsy would add scents that actually come from Disney theme parks. These scents can be found on many non-official websites, so people out there are making them. It would be nice to have Disney authorized scents to make it more official. Other than that, I enjoyed the Scentsy products and really love the packaging. 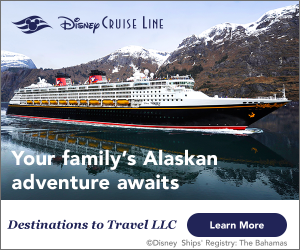 Want to win some Disney Scentsy products for your home? Join us on November 6, 2018 at 8pm eastern for a Facebook Live party where we’ll be giving away a set of some great Scentsy products! Follow us here for all the details!